David brings us the tale of a phantom Nurse! I have a close relative, as you may recall, who once owned a private school in the West Country... In the Autumn of 2002, business took my wife and I down to Exeter: naturally we enquired whether, it being Half Term, we might stay at the school. The answer being in the affirmative, we duly arrived at the monolithic Napoleonic pile at around tea-time. You should know: it is a long climb up four flights of steep stairs to the top of the house: this is where our bedroom was located! While my wife renewed acquaintances with the family, I undertook the arduous climb with the bags..... At the top of the stairs is a corridor: there are bedrooms to the front and left: ours was on the left. Entering, I placed the luggage on the floor and turned to leave, in time to see a Nurse cross from the top of the stairs into the facing bedroom: she turned her entirely agreeable face to me and smiled! I of course smiled back at the unexpected neighbour! Returning downstairs, I enquired of our host who the other guest on the top floor might be. Barry (for that is his name!) evinced surprise and perplexity! 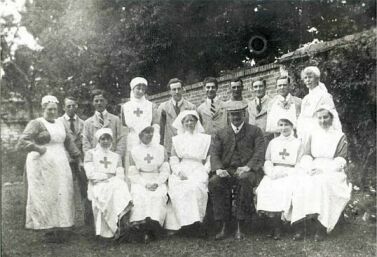 I described my encounter: Barry's normally ruddy complexion grew somewhat pale...... After a second or two's reflection, our host informed me that the school had been a hospital during the First World War, and that I had described with total accuracy the uniforms worn by the nursing staff: this he could vouch for, since he had a photograph taken at the time. Barry went to find the faded sepia print, returning triumphantly after a minute or two's searching. Of course, you have guessed the rest! There, among a group of nurses was the young lady I had encountered just a short time before! Several years ago the company that I work for needed to expand, and thus when the opportunity arose, the Factory next door was bought up and purchased by my former managing director. At the time of the purchase I worked on the shop floor. Now prior to the purchase of the factory, employees of the company that was still working in there used to play football in the shared yard with workers from our factory. "And, oh yeah..... Watch out for the ghost!" Six months passed, during which the purchase was made and the factory was bought. At the same time we reached an above normal busy period: on top of this, the department which I ran was designated to move into the new factory, along with two other departments. Imagine the chaos! setting up and re-establishing yourself in new surroundings. Now I had often complained to my boss about lack of workspace, so when the opportunity arose for more room, my department was more than keen to prove that we could move departments and keep up our work schedule. This did mean working late: however, we were used to working long hours. However, after two weeks, during my 10am tea break, I collared one of the guys next door, who promptly told me that they hadn't had overtime in years. I suggested to him that someone has left the radio on. "No," he replied "we haven't got a radio!" Two days later my department had to do some work in our former factory, which was across the road. That evening I popped over to the new factory to boil the kettle and make every-one a cup of tea, only to be confronted by the foreman of one of the other departments that had just moved over. Then I continued, without thinking "You've heard it as well?" "Two men arguing..... One younger than the other..........Can't understand what they're saying?" We deployed some machinery: the most powerful equipment we had would cut out around 11pm without any reason The manufacturers suggested going over to single phase, which we did. Eventually we caught on a monitor high surges of electricity around 8.30pm to 11.30pm. Rumours and gossip spread on the shop floor...... However, two other people did come forward and said that they too had experienced something: both had felt powerful pinches on the arm!!! Several days latter I too had the same unexpected and unpleasant sensation! I also underwent the un-nerving experience of hearing my Christian name being called out aloud! I was totally alone at the time! My general manager at the time dismissed this as over-tiredness and, that evening, worked late with us to dismiss any rumours. At 9 am he took us up the road to get a take-away for dinner, having personally insured that every door was shut prior to us leaving. When we got back, one of the fire doors was gaping open: this was the fire door that I had closed!!! I am a manager of the company now, and last year decided to run a night shift. I have the luxury of new staff, and if I may say so, I am very proud of them! "I don't mind, but the blokes next door don't stop arguing! And the storm flies!!! I've been bitten on my arm five times!!! My father is the most level headed man you could ever meet. You can't confuse or cheat him (believe me, I tried enough times as a boy!). But he tells me he saw a ghost and I believe him. He was in the army (King's Liverpool, of course) during the emergencies surrounding the creation of the Israeli state in 1947/8. Part of his duties was to guard "terrorists" (I don't know if they were Palestinian or Israeli) in a barbed wire camp, overseen with United Nations administration. Anyway, one night, not yet dark, the guard corporal told my Dad he was due to man the guard tower in a couple of minutes, so Dad went out and shouted to the guard to come down (two men could not cross on the steps up, so the present guard came down first). the corporal with some sort of message. Dad went into the Guardhouse and emerged a couple of minutes later. Seeing a soldier already in the guard tower, he thought the present guard must have gone back up, so took the chance to answer the call of nature. After finishing, the guard corporal saw my Dad, asking (in a forthright military manner) why he wasn't already on duty. Dad said that the present guard had gone back up, the corporal disagreed, mentioning he was in the guardhouse with a mug of tea. 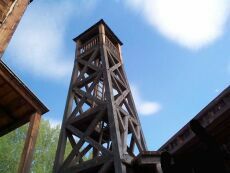 Dad said someone was in the guard tower. Both he and the corporal walked toward the tower, where in the now failing light, they could clearly see a British soldier with a rifle and bayonet. Both looked at each other puzzled. The corporal shouted at the soldier, eliciting no response, then ran up the steps with my dad following. Upon reaching the guard tower floor area, you've guessed it: nobody.